Published: Fri. July 7, 2017 at 1:43p.m. Our mission was clear when the Mahoning Valley Flight Crew departed our regular session June 27. Travel plans and the fact that the Fourth of July fell on a Tuesday, our meeting day, interfered with our typical weekly schedule. So, we all agreed to prepare either a Facebook post or a blog about our favorite beer of the week. Since my wife, Tonya, and I were traveling to Cincinnati to visit our daughter, Kayla, an idea popped into my mind. We’d be just minutes away from one of Cincinnati's fastest-growing and best breweries, MadTree Brewing Company. A perfect opportunity for a blog post. Missing a weekly Flight Crew gathering isn’t taken lightly by the guys. We have a busy few weeks coming up — including a visit to Heidelberg Distributing for our next feature article in The Vindicator, volunteering for a beer taste for the Boys and Girls Club of Youngstown, throwing out the first pitch at a Scrappers game, and an appearance on WFMJ-TV21 — so, we figured missing a week wouldn't kill us. I'd heard a lot of positive things about MadTree. After our visit, I could see why. The brewery opened in 2013, and it was the first Ohio brewery to begin canning all of its beers. Earlier this year, MadTree opened a brand new, $18 million state-of-the-art facility. The brewery produced about 35,000 barrels of beer last year. But there’s plenty of capacity at the new facility to grow. Based on the beers I sampled, growth seems like a foregone conclusion. Knowing I was going to be visiting, I reached out to the brewery a few weeks in advance. Mike Stuart, director – people and social strategy, was my contact. Mike, a former beer blogger himself, gave Kayla and me a thorough tour the facility and talked to us about some of the new beers that were coming out. MadTree has sort of taken the Henry Ford approach to business — you know, quality is job #1. Many of the new features at the brewery are designed for consistent quality of MadTree’s products, which I could taste in the beers. 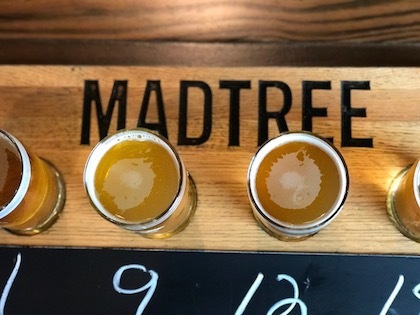 One of the most scrumptious nuggets of information revealed during our visit is that MadTree beers soon will be distributed in the Mahoning Valley. Cavalier Distributing will bring MadTree to Youngstown and the surrounding areas beginning in August. While a pint of any of these beers would have made me quite happy, I chose the Entropic Theory IPA, the brewery’s newest offering. With its citrus aroma, a smooth bitterness and delicious tropical flavors, it seemed like it was brewed just for me. I can see why the first batch sold out extremely quickly! 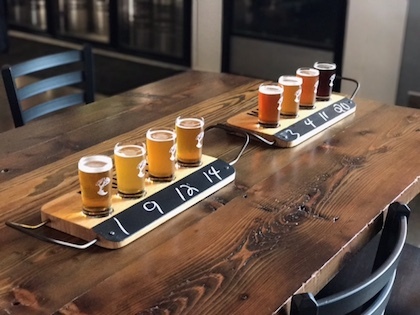 The bottom line: If you’re in Cincy and you’re looking for a relaxed atmosphere, great craft beer and a wonderful time, you’ve got to hit MadTree. And, soon enough, you'll be able to grab your favorite MadTree beer right here in the Mahoning Valley.